Congratulations on taking your first step into the aquatic realm! 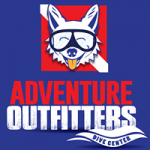 Adventure Outfitters is a PADI 5-Star Dive Center and family-owned and run business which prides itself on quality private and small class sizes with personalized courses. All of our instructors are PADI Master SCUBA Diver Trainers. PADI is the world’s premier certifying agency leading the safe practices and standards in diving worldwide. We make sure that each student diver receives the utmost attention when it comes to personal instruction, high quality rental gear, unique dive sites, and the overall experience. We make sure that each student diver receives the utmost attention when it comes to personal instruction, high quality rental gear, unique dive sites, and overall experience.We spend as much time as it takes to ensure that you not only master each skill, but become a confident and informed diver, ready for today’s high tech dive scene. 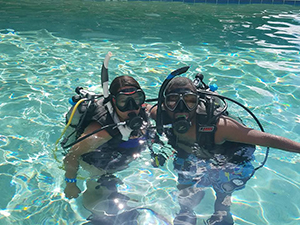 By teaching only private, semi-private lessons and small groups (with plenty of certified assistants) we go by your busy schedule, and give you not just the training but the experience to be a safe and successful diver. Our classes are typically small, only one to four students (upon request, we do larger classes, up to eight); we go by your schedule, and allow you to change your dive days if you need to; we don’t require you to purchase extra, expensive gear for the class (others require weight belts, wetsuits, compasses, etc…); we bring all of your gear to the private pool and dive sites (saving you time from going back and forth to the dive shop and filling out rental forms); all of our rental gear is top quality and new; we also don’t have time limits for your dives. If you need more time to practice your skills or just having fun looking at fish – you get that extra time! We also encourage all new divers to participate in one of our many clean-up dives to receive additional training at no extra charge. If you have a friend, family member or partner that already dives, they can join you on the last dives provided they do not interfere with the course. 1. Independent Study: There are two options: You can choose either eLearning to accomplish your independent study on your own schedule (no classroom session necessary). Once you have paid for your course, we email you a PADI eLearning code for eLearning online registration; or chose the Study Materials and Classroom Session – You receive an Open Water Study Materials once you have paid for your course, you read the chapters and complete the knowledge reviews prior to attending a classroom session which will be prior to your pool session. 2. Confined (Pool) Session: We typically only use private pools, making it easy to schedule your pool session on your time. This allows us to review and practice skills in a calm environment without having to dive around others. Since we only have private and semi-private lessons, this is usually accomplished in approximately 3-5 hours. 3. Open Water Sessions: Over the course of two days we will go to two different dive sites for your four open water dives. 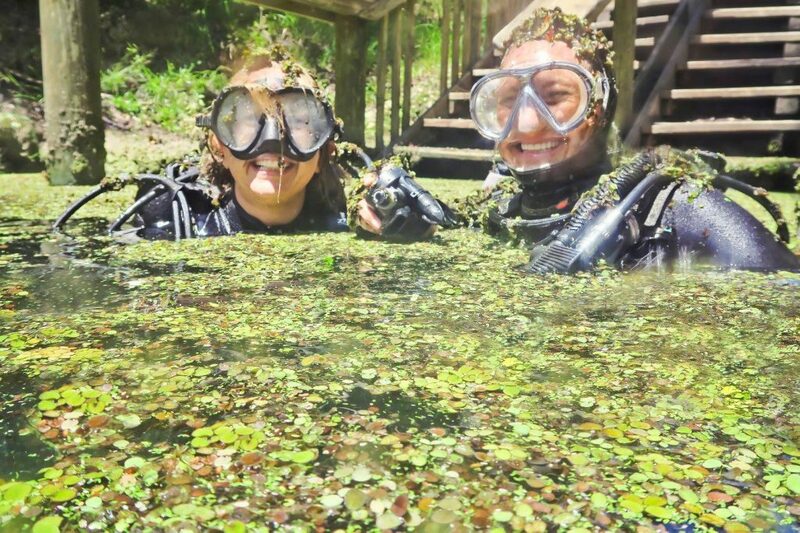 We typically go to either a Florida fresh water spring (Devil’s Den, Blue Grotto, or Hudson Grotto) or to Denton Lake to perform most your skills on the first day, then, weather permitting, we will go either on a Gulf boat dive or a Gulf shore dive for the second day. 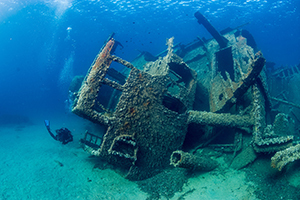 This allows you to experience both fresh and salt water and different types of diving sites our area has to offer. 4. 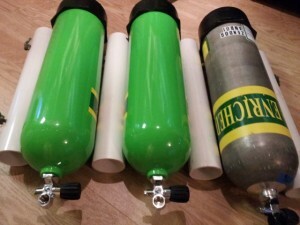 Optional Enriched Air Course: To help our students continue their diving education, we offer a discounted rate for taking the Enriched Air Course during your Open Water Course. The most popular specialty class, Enriched Air Diver is 50% off when taken with the Open Water Course. Purchase the study materials prior to your OW class and read and complete the knowledge reviews along with your OW course material. Mask, DeFog, snorkel, fins, and boots: Every diver needs their own personal gear. (Needs to be scuba suitable, not snorkeling gear.) Before you start your class, we will walk you through the different types of diving and scuba gear, and what you will need for diving. You will have an opportunity to try on different types of gear to ensure a proper and safe fit. Our gear is all competitively priced and hand selected by our instructors and service technicians to get you the best gear for the best price. You will need to have a well-fitting scuba mask, snorkel, pair of boots and fins, and mask defog to complete the course. These are all personal items you will use in all of your underwater adventures. We have student discounts for all of this equipment. With the discount, we are always below MAP (minimum advertised price)! Things to bring during your pool and open water sessions: Your personal gear, swim suit, towel, snack/sack lunch and sunscreen (if needed). Fees (include study materials, all rental gear, certification card fee, pool entry fee, and instruction): Our fees include either the eLearning online session or the study materials/classroom session! You never have to pay for rental gear and tanks during any portion of your open water course! We will help you with your weighting needs (this is dependent upon type of water and type of wet suit you will be using – it is typically 10% of your body weight.) eLearners will need to pick up a required log book prior to the pool session ($21.85). To reserve your spot, you must place a $200 deposit with the shop. Learn more about our other courses here! Don’t see one on our schedule? Ask us about it! We work around your schedule! We understand that your family and your health come first. If you must cancel your course, please call Adventure Outfitters at 813-832-6669 or email us at info@adventuretampa to reschedule as soon as possible. We are dedicated to serving our students and this gives you the best chance possible to secure the right timeframe for you. Group and Semi-Private Lessons: To protect students and instructors alike, Adventure Outfitters enforces a the right to charge full price unless the student cancels at least 24 hours prior to a course. Student will receive a 50% store credit refund if canceling at least 72 hours in advance. Private Lessons: a student must cancel at least 72 hours prior to the course to receive a partial store credit refund.